See a recent NY Times Article about Casa Delfín Sonriente and Troncones entitled 'Where the Waves Still Win'. Also from the Lonely Planet guide "Guests rave about the peaceful, welcoming atmosphere at this B&B ""See what else the Lonely Planet says about Casa Delfin Sonriente". 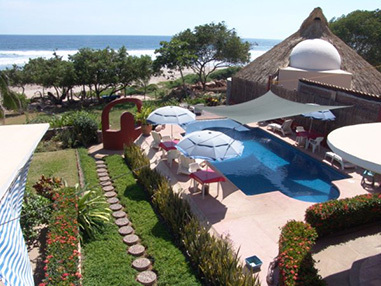 Situated on the Pacific Riviera Coast, our beautiful Troncones Bed and breakfast hotel , Mexico rental home, or Mexican Villa is perfect for beach weddings, yoga retreats, Mexico family vacations, and right out front you'll find fantastic Troncones surf. Enjoy warm water and sunny beach, swim poolside, relax and read in a hammock underneath cool and shady beach front shade ramada, or enjoy a long healthy snooze. Activities include swimming in the ocean, snorkeling, mountain biking, horseback riding, fishing, caving, beachcombing, body surfing, boogie boarding, hiking, and kayaking, bird watching, and enjoying the spectacular sunsets from one of the most popular Villas in Mexico. Take a photo tour of Casa Delfín Sonriente, including the neighborhood, local environment, activities and the surf! Copyright 2019. Casa Delfin Sonriente. All Rights Reserved.